← Has Energy Wastage Really Decreased Over the Years? Science and religion are often times considered to be far apart on the spectrum of academia. Nevertheless, the efforts of Pope Benedict XVI, also known as the “Green Pope” have effectively linked Catholic faith with working towards a more energy efficient world. 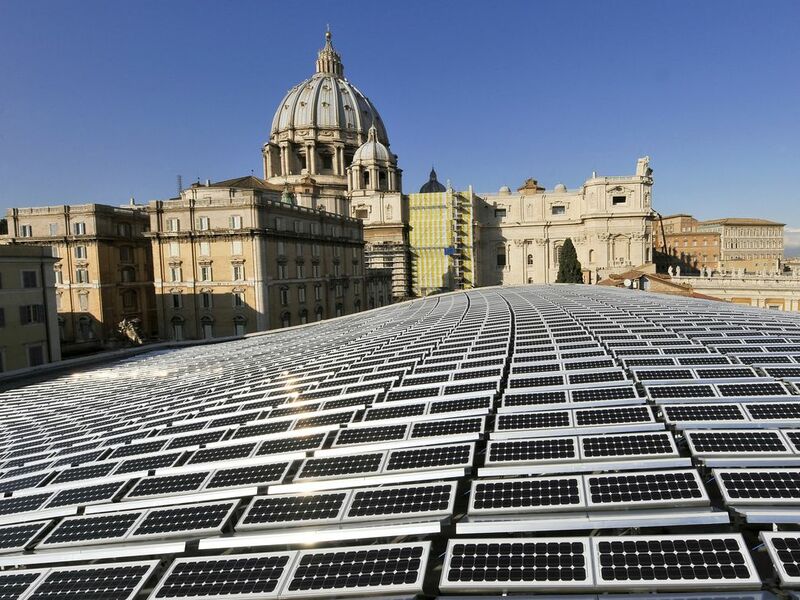 In 2009, Pope Benedict XVI installed over 1,000 solar panels in the Vatican. 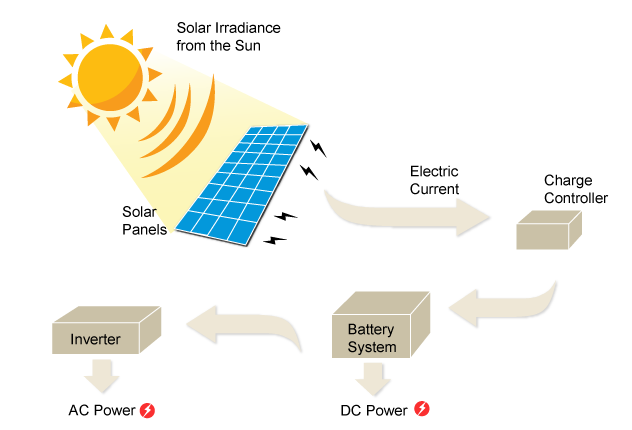 Solar power is energy from the sun that is converted into solar or thermal (heat) energy. Figure 1 shows the highly efficient roof of the Vatican. Solar power is a clean energy source, meaning it’s efficient and renewable. Solar panels are “large flat panels made up of solar cells.” (seia) These solar cells are made of materials that, when struck by light, turn the energy within sunlight into an electrical current. This electrical current can then be harnessed as electricity. Figure 2, illustrates this process. The most important thing to understand about solar energy, and all sources of clean energy, is that it generates electricity with little to no pollution or contribution to climate change. The Catholic’s church journey to energy efficiency isn’t limited to the actions of the “Green Pope.” Last month, a group of Catholic Bishops from all over the globe “called on the world’s governments to end fossil fuel use…citing climate change’s threat to the global poor.” (thinkprogress) Climate change is any notable change in temperature, precipitation or wind patterns. It is attributed to large amount of carbon dioxide and other green houses gases entering the atmosphere. The majority of these greenhouse gases are emitted through the burning of fossil fuels to produce energy. The greenhouse gases that build up in the atmosphere “act like a blanket around Earth, trapping energy in the atmosphere and causing it to warm.” This process is called the greenhouse effect. This resulting change in climate is dangerous to the health of ecosystems and humans. For example, through changing the consistent climate of a region, the population’s ability to obtain water and maintain agriculture can be disturbed. The bishops also called for a global agreement to lower carbon emissions. They argued that in doing so “the immediate needs of the most vulnerable communities” will be prioritized. The globe’s most impoverished populations are particularly vulnerable to droughts, floods, storms and other extreme weather attributable to climate change. The Catholic Bishops called attention to the moral side of energy efficiency by connecting the use of fossil fuel to victimizing impoverished populations. The way in which the Catholic Church is able to relate an issue rooted in science to a question of morality is articulated when Daniel Stone notes, “Benedict (the Green Pope) is able to “inject morality into environmental debate. Changing light bulbs or saving a wild animal by protecting the habitat wasn’t about saving money… but was a religious obligation.” (nationalgeographic) Making clean energy the scrupulous choice is an excellent way to spread awareness of energy efficient practices. Often times when people think of saving energy, it’s simply to save electricity. Usually saving energy isn’t a a question of the right thing to do. When Pope Benedict says, “If we want justice and peace, we must protect the habitat that sustains us, “ he makes saving energy a question of being morally right or wrong. Furthermore, he connects Catholic faith to preserving the environment through energy efficiency. I’m not religious, but, to me, tying energy efficiency to being ethically “good” is more affective than knowing that I save X amount of energy when I turn my light off or recycle. The key to getting anyone to do something is getting him or her to care. The actions of the “Green Pope” and the Catholic Church are a step towards doing just that.